#9. Does God get tired of listening to me? #8. 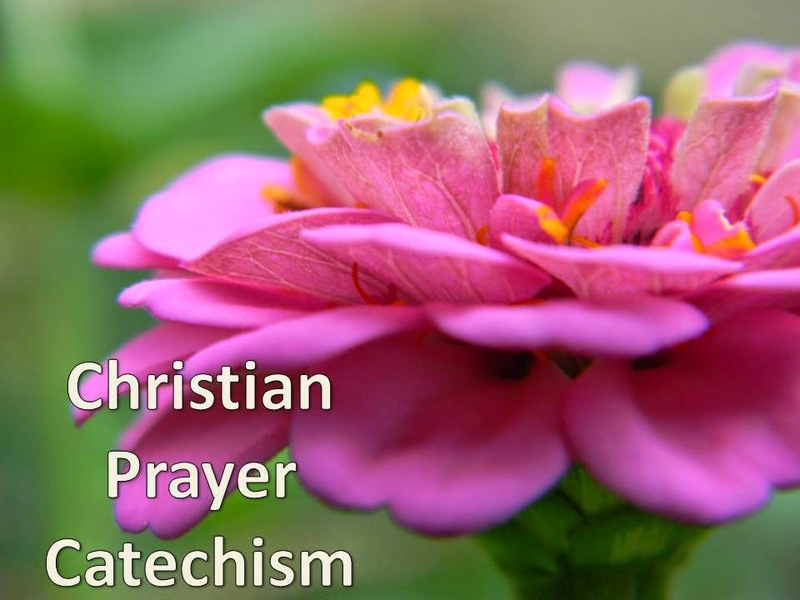 Why do we pray to an omniscient God? Romans 12 is important because it’s the first chapter in Romans to really tell us what to do. Chapters 1 through 11 told us what to believe, and that’s crucially important. We need to believe the gospel of grace. We need to believe in justification by faith alone in Christ alone to the glory of God alone and all of the amazing blessings and trustworthy promises that come with that gospel of grace. But after 11 chapters of what we need to believe, here Paul begins to tell us what we need to do in light of that grace. That’s what we’re supposed to do–to give our whole selves to God. And then, we will be CHANGED. We’re spending so much time together in Romans 12 because God wants to tell us here what kind of “A Transformed People” He wants us to become. A community of Christians who have been changed and are being changed by the gospel. As with the last two Sundays, I’m going to read this whole section to you, verses 9 through 21, but then only preach a few of the bullet-point verses. Two weeks ago, we focused on verses 9 and 10. Then last week, we did verses 11 and 12. Today, I’m going to go large and try to do 4 verses, verses 13 through 16. And as we unpack them, I’ve got three major headings of character qualities that “A Transformed People” will exhibit. Have you been infected by the gospel of Jesus Christ in such away that you have been changed and are being changed into the person that God wants you to be? Are you different from how you used to be? Are you different from how the world is? Are you breaking out of its mold, and being transformed by the renewing of your mind through biblical truth? There are nine imperatives in these four verses. Nine commands to obey. And obeying them does not come naturally to people like you and me. Some of them are easier than others, but none of them are natural. They are supernatural and they require change. Paul proceeds in three ever more difficult steps. First sentence of verse 13. The word for “share” here builds off the word for fellowship “Koinonia.” Having something in common. Here there are Christians who have needs, and a people transformed by the gospel will see those needs and respond with generosity. Does that come easily or naturally? Well, I suppose for some people it does somewhat. Some people are just naturally generous. But this is supernaturally generous. This church is really good at that. You folks are amazing at seeing the needs that others have and doing something about it. I’ve learned so much about generosity from watching you in action. I’ve learned that when I see a truly needy fellow Christian that I ought to be willing to meet that need. Now, the Greek word for “hospitality” here is “philozenian.” And it means to love a stranger. This isn’t just being generous with those people that you know and love already and are like you. This is being generous with your home and your resources for those who may not be like you and may even be passing through. People you just met! Have you ever had anyone over to your home that you just met? Some people aren’t willing to use their homes as ministry tools at all. But this is calling us to not only use our homes in ministry but to use them in ministry to strangers. Now, there are safety aspects of that kind of ministry that should be taken into account. We are called to be prudent, to be wise, to be a shrewd as snakes while being innocent as doves. It’s right to be careful in practicing hospitality, but we are called to pursue hospitality. Using our homes and other resources to show the love of Christ to strangers. Being a pastor near an exit on an interstate led to some pretty interesting interactions over the years. I remember once meeting a group of young people from the inner city who had run out gas here at Kylertown and didn’t even have a jacket among them even though it was January. I remember the young guy, not much more than kid named Fred said, "I'm not used to this hospitality!" Our kids enjoyed playing with them. And then when it was time to leave, they backed up into the yard and their car wheel fell into a hole that the kids had dug in the front yard! We had to get out and push them out of the hole. It was Wednesday night, and we brought them to church with us. I knew how you folks would treat them. I knew that you would take them in as family and show them hospitality here on our campus. I gave him one of my old ones from High School. I didn’t fit in it anymore. And they were really thankful. That’s ministry folks. It doesn’t come naturally, it comes super naturally. “Practice hospitality.” Be generous with your home. Go out of your way to care for travelers, strangers, aliens–those different from you. Don’t conform to the world. Be transformed and pursue hospitality? Do you see how counter-cultural, how counter-world these things are that God is asking us to do? I know that one doesn’t come naturally! Paul is obviously drawing from our Lord Jesus’ teaching on the Sermon on the Mount. To bless those who persecute us; bless and do not curse. It’s pretty near impossible to do if you don’t know the grace of our Lord Jesus Christ! But Jesus’ way is more than just the opposite. It’s not just refraining from cursing your persecutor, it’s blessing them. I believe that loving your enemy is probably the hardest thing that Jesus ever taught us to do. But if He hadn’t done it, then none of us would be here today. We live off of the love that God had for His enemies, and we’re called to do the same. By the way, that’s how we do it. We remember that while we were still God’s enemies, Jesus died for us. In view of the mercies of God, be transformed to bless your enemy. Bless and do not curse. That means seeking blessing in tangible ways on those who hate you. That means no cursing them on social media. That means no cursing them under your breath. That means no cursing them anywhere, but instead blessing them. Now, Paul is going to expand on this in verses 17 through 21 which, Lord-willing, we will study together next week, so we’ll talk more about what this looks like, but I want you to see just how counter-cultural, counter-intuitive, and counter-natural this is. Practice generosity even with your enemies. I almost said, “solidarity” for this point, but I decided that it was too big a word. A transformed people will be marked by unity. Now, that sounds good, but then you realize that sometimes you’re supposed to do both of those at the same time. Because in a church family there are some people who are weeping at any given time and at the same given time those who are celebrating something. And a transformed people will do both. They will be unified and empathize with those who are hurting and party with those who are partying. What gets in the way of that? Envy. It’s hard to celebrate with someone if you wish you had what they are enjoying. When someone else wins the race or gets the girl or achieves the rank or lands the job and you wish it was you. It’s hard to rejoice when they rejoice. It’s also hard to mourn when you are secretly glad that something bad happened to someone else. Smugness. A sense of self-righteous justice. When you say that to yourself with that tone of inner voice, you’re probably not mourning with those who mourn. A transformed people will be marked by solidarity, by oneness, by unity with each other, no matter what is going on good or bad. You know one place where I’ve tried to apply verse 15 recently is to all of racial conflict and conflict with the police that we’ve seen in Baltimore and other places this last year. I try to mourn with the black families who have lost their sons. And at the same time, I try to mourn with the police families who have lost theirs. I don’t think it should be either/or. That’s what the world says. That’s what social media says. Especially in the body of Christ. Verse 16. Share the same values. Live in gospel-centered unity. As followers of Christ, we are to be peacemakers and unifiers, bringing people together. Not folks who are always looking for a fight. Of course, this does not mean that we will always agree with each other. But it means that we should work towards agreement and disagree agreeably whenever we can. The church needs to be unified. I love the strange imagery of Psalm 133. There was nothing more holy than that smelly gooey stuff anointing Aaron and he was covered with holiness. And that’s what unity is. It’s utterly holy. Unity is refreshing like the dew of massive Mount Hermon falling on tiny little Mount Zion and springing it to life with all of that juicy verdant goodness! A transformed people will be marked by holy and refreshing unity. What steps do you need to take to live out that command? How do you need to change so that you are harmonious with other Christians? We can’t just be itching for a fight. The way forward to that unity involves number three. A transformed people will be marked by humility. Verse 16. Of course, some of us have a lot to be humble about. I suppose some people are more naturally humble than others. But pride is a problem that all of us deal with. And we need to be transformed. The world says that everything is about us and should revolve around us. And the world says that we should play up to important powerful people, people who can get us something and improve our standing and reputation. But God says to associate with people of low position. And don’t think too highly of yourself. When I was a student at Moody Bible Institute, I took part in a ministry to homeless and jobless people affiliated with First Evangelical Free Church of Chicago named Breakthrough Urban Ministries. My job was to show up and listen to people. Not teach them anything, just listen to them. And when I could, I was to try to help them develop a resume. And print them out for them to work on getting jobs. I remember taking a guy in my car across Chicago to a burger joint that was hiring and he had his one page resume that I had typed for him. And it was a joy to know him and all of them. They weren’t great and powerful. They were small and almost helpless socially-speaking. But we are called, as God’s people to stoop down and get on the same level as others and not to think that we deserve to be on any level. Isn’t that what God showed us in Jesus? And being found in appearance as a man, he humbled himself and became obedient to death–even death on a cross! Our attitude should be like his. Humble. The world says to be proud. Stick your chest out and be proud. Love the poor. Love the helpless. Stoop to tie the shoe of little kid. Listen to the mentally handicapped person when they try to tell you a story. Move into rougher neighborhood instead of moving on up. Don’t look down your nose at “those” kind of people. Don’t get drunk on yourself and up on your high horse. It doesn’t come naturally, only supernaturally. Only through the gospel of a humble God-Man. Isn’t that an amazing thought? A humble God-Man?! The gospel is good news of crucified God who became man and humbled himself to die for you and me. And so we can humble ourselves, too. Have you been changed and are you being changed? Is your life marked by generosity? It’s easier with God’s people, harder with strangers, and near impossible with enemies, but God says to do it. Is your life marked by unity? Are you picking fights or your standing in solidarity with those mourn and those who rejoice? Is your life marked by humility? Are you proud, conceited, thinking too highly of yourself? Or are you willing to associate with the last, the least, and the lost? 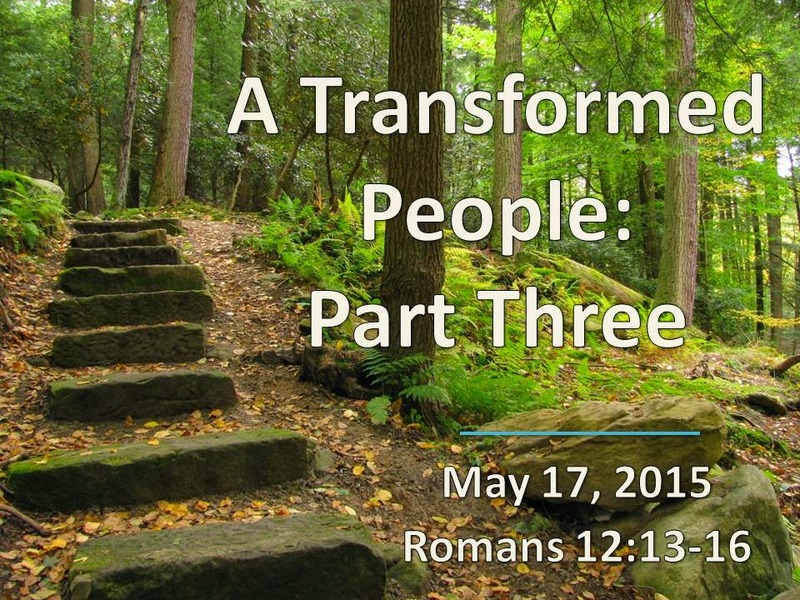 May God make us a transformed people who live counter-culturally, counter-intuitively, and counter-naturally. Becoming different from the world. No longer conformed but transformed by the gospel of grace. #7. Does prayer change God’s mind? Let me ask you a fundamental question. And I mean, for the better? I don’t know how many times in the last month I heard someone say that someone else, sometimes it was themselves, will never change. I almost kept a running count! How many people have said to me in the last month that they wouldn’t change or that someone they knew wasn’t ever going to change? Or couldn’t change? How many times did I say something like that? Well, so-and-so isn’t going to change. Can a person go from being one kind of person to being a different kind of person? Consistently, truly, authentically? In fact, Christ-followers must change. It’s like the definition of what it means to be a follower of Christ, someone whom Jesus is changing. Ever since, Paul started chapter 12, he’s been telling us how we need to live now that we’ve received the gospel of grace. Because of the mercies of the gospel, we are supposed to give our whole lives over to the Lord in worship. 24/7. Living sacrifices. And as we do that, God is going to change us. He’s going to change everything about us on some level. Verse 2. Followers of Christ can change. In fact, followers of Christ must change. A couple of weeks ago, we saw that that change affects our thinking. Including our thinking about ourselves. We should think of ourselves humbly, as belonging to the body of Christ, and gifted for the body of Christ. And last week, we heard Paul start to give us these short, bullet-point messages of how we need to live, how we need to change. We need to be a transformed people. Last week, we read the whole thing from verses 9-21 but we just focused on verses 9 and 10. Today, I want to read the whole thing again, verses 9-21, but we’ll just move forward two more verses, verses 11 and 12. Of course, it is Mother’s Day. I thought about putting Romans on the back burner for a week and doing a message simply about and for the moms among us. But as I meditated on verses 11 and 12 this week, I saw that there was plenty here that applies directly to the Christian moms among us. So this message is for all of us, but I think we’ll see how it applies directly for you Moms in particular. Today, I have two main points. One to summarize verse 11 and one to summarize verse 12. 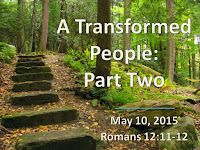 They are two ways how the people of God are to be transformed and to keep being transformed. Listen to that verse in a few other English translations. Now, what King James meant by “business” was not running a business and serving customers or making products like we think of today. It meant busyness. Eagerness. Earnestness. In other words, keep your spiritual temperature burning on high. Boil, boil, boil. Bubble, bubble, bubble, bubble. There should be a constant simmering of your spirit towards the Lord. The spirit here in verse 11 could also be the Holy Spirit. Which would mean allow the Holy Spirit to be constantly burning in you. Constantly giving over your heart to Him to change and orient you Christward. Either way, it’s staying on fire for the Lord. Does that just naturally happen? Or do we need to be transformed people for that to happen? No, the world says, “It’s okay to be spiritually lazy. It’s okay to let your fire die down. But God says, “Do not conform any longer to the pattern of this world, but be transformed by the renewing of your mind. Stay on fire for the Lord. You rehearse all of the mercies of God. Yesterday, I was in State College and I saw those huge cranes again. Those cranes have an tremendous reach and strength to them. But they can only swing out as far as they a rooted in something deep and strong. The foundation is so important. The gospel of GRACE is our foundation for spiritual fervor. Anything else will be just a flash in the pan. Have you ever tried to stay spiritually on fire some other way than the gospel? There is no technique for staying spiritual fervent. No 5 step plan that always works. But in the gospel of Jesus Christ is all of the fuel you’ll need to stay on fire for the Lord. Think about the mercies of God. Think about the love of God. Think about the Cross of Christ. Think about the gift of the Spirit. Think about your sins being forgiven. Rehearse the truths of Romans 5 or Romans 8. And your spirit will boil. Now, that does not mean that you will always feel on fire for the Lord. Don’t get up caught up in the feeling trap of trying to work up your emotions to a constant fever pitch. This isn’t saying that we should always feel excited about God. This boil might not translate into the same emotions all of the time. Emotions come and go and go up and down. But this boil can go through them. Notice how this spiritual fervor is worked out in practice. This fire isn’t just excited worship, jumping up and down and waving your arms. It comes out in SERVANTHOOD. Being enslaved to the Lord. That means doing His will. It means working. It means being active in ministry. It means serving the Lord by serving others with a servant attitude. I saw a poster on social media last night. It said, "How can you tell if you are a servant? How do you respond if you're treated like one?" A transformed person is humble and is not easily offended. Now, how does this apply, do you think, to the Christian moms among us? Moms, stay on fire for the Lord. They are watching you. Whether they are 2 years old or 22 years old or 52 years old. You don’t have to show it off. They will see it. It will seep out. If you are spiritually boiling inside, they will feel the heat. Your job is to be transformed. To keep feeding that fire. I’ve told this story many times, but because it shows off my ignorance, it’s fun to tell again. When we first got our outdoor wood burning furnace, I filled it up and then didn’t check it. I remember when I bought the thing that the guy said that it would go 24 hours without needing filled. Of course, I bought the thing in August, and we installed it in January. Do you think that maybe I should have checked it that first day a few times to see how it was burning? Not I! Not in the middle of the winter! I still had a few things to learn. The next day, I went out there and opened the door, and it was empty inside. In fact, there were what I thought were icicles inside of my firebox. My fire had gone out because I wasn’t filling it. I had gotten lazy from the start. And we had to start all over again. What do you need to do today to rekindle that fire or kick it up a notch? Perhaps you just need to pray. To repent, to ask for forgiveness for spiritual laziness and put yourself back on that living sacrificial altar once again. All three of those imperatives are to keep on keeping on, even when it’s hard. So, that means to rejoice even when things aren’t going well. When you have to rely on your hope for the future, not your present situation to give you joy. Rejoice even when things aren’t going well because you know that one day they will. Stay on track with joy in hope. That word “patient” is Pastor Alex Ielase’s Greek word for us. Anybody remember what it is? Patience or endurance or perseverance. Even when times are tough. Affliction. Trial. Tribulation. Difficulty. A transformed person hangs in faith even when times are tough. No, it’s hard. And it doesn’t come naturally. “It’s okay to give up. It’s okay to give in. It’s okay to roll over. Stay on track with the Lord. Does anybody see how this applies to being a Christian mom? I’ve read this to you before on Mother’s Day, but it never grows old for me. And those are the easy parts of being a Christian Mom! That says nothing about whether the howler monkeys grow up to disappoint you. Or to reject your Lord. Or contract a grave illness or have some other problem that puts you into a bind. Moms, be joyful in hope, patient in affliction, and faithful in prayer. You need it. Your kids need it. That doesn’t come naturally. That requires transformation. That requires change. Nobody is naturally faithful in prayer. That is work of grace. It comes easier to some than others, but anyone whose life is marked by faithful prayer is someone whom God has graced. Be steadfast, immovable. Stand firm. Keep praying. What changes do you need to make in your life starting today to stay on track withthe Lord in this way? For some of you, it would be trust Jesus in the first place. You can’t be transformed by the gospel until you’ve believed the gospel. Some of you probably need to call upon the Lord for salvation. Confess with your mouth that Jesus is your Lord and believe in your heart that God raised Him from the dead, and you will be saved. And then stick to Him no matter what. Come hell or high water, no matter what. Can we change so that verse 12 characterizes our lives? I’m thankful to have been a witness to significant change in people’s lives in the last month. I told you last week about an older fellow on that retreat I went to who had a change of heart and of tongue last weekend. This week, I met with two younger guys who are changing in other ways. One it’s what he’s listening to. He no longer listens to or even wants to listen to raunchy music, but is filling his ears and mind with good, solid, healthy stuff. Another one is changing what he’s reading. And he’s getting serious about studying his Bible. Followers of Christ can change and must change and will change. If you don’t change all, if you aren’t changing all, maybe you aren’t following Christ at all. We are called to be a transformed people, transformed by the gospel of grace in Jesus Christ. Staying on fire for the Lord and staying on track with the Lord. #6. Why do we pray to a sovereign God? We’ve slowed down again, haven’t we? Back in chapter 8, we took several weeks to study the whole thing, and then we marched fairly quickly through chapters 9, 10, and 11, but we’ve slowed down again in chapter 12. And we’re going to slow down even more. Today, I want to read to you chapter 12 verses 9 through 21, but I’m only planning to teach on verses 9 and 10. Think of this as a mini-series on Romans 12 within our maxi-series of All Roads Lead to Romans. That word “transformed” comes out of Romans 12:1-2. Last week, we said that the transformation of our mind includes our thinking about everything, including our thinking about ourselves. We should think of ourselves humbly, as belonging to the body, and as gifted for the body of Christ. But the transformation doesn’t stop there. It affects everything in our life. Just as the world wants to press us into its mold in every area of our life, so the Lord wants to transform every area of our life. And this next section, verses 9-21, is full of short bullet-point commands of how we need to change, to be transformed. And most of them are about community. They are about relationships. Because it’s the people who are transformed and not just as individuals but in our relationships with one another. Community. A Transformed People. You’ll see it as I read the whole thing to you. Before I do, I want you to hear again in the back of your brain that this is all THEREFORE stuff. The transformation of God’s people is all based on the mercies of God in the gospel of grace. We can’t do this stuff on our own. We need God’s grace to live this way. This is transformed living. It’s supernatural. And it’s because of what Jesus did. Do you see what I mean by saying that Paul is going to ask for some pretty big things in these chapters? We need 11 chapters of God’s grace to fuel our obedience to these big requests. God wants us to change, to be transformed, and it takes God’s grace to do it. Do you see what I mean by saying that these are bullet-points? Little staccato sentences that pack a big punch. This is one sermon where I don’t have to come up with my own summary points of application. Paul has done it for me very nicely. There will be four today. #1. LOVE MUST BE SINCERE. I don’t know about you, but I don’t like fakes. I want the real thing–not a fake. I don’t mind if something is artificial, if they tell you it is artificial. I don’t mind if something is synthetic, if they tell you that it is synthetic. But when someone tells you one thing, and it is really another–that drives me nuts. I hate fakes. God loves what is genuine, too. God looks on the heart and can see if someone is being authentic and genuine or a fake. And sincerity is what He desires for our transformed relationships. “Love must be sincere.” v.9 says. The old KJV puts it, “Let love be without dissimulation.” That means no simulations allowed. No fakes. The great theologian George Burns once said, “Sincerity is the key to success. If you can fake that, you can get away with anything!” I wouldn’t have wanted to be George Burns’ friend! Have you ever had a friend that wasn’t really a friend? Back when I was a youth pastor, I saw a lot of that problem among the teens that I worked with. Two people can spend a lot of time together, have similar interests, and share a lot of personal information, and yet not be real friends. The teens (especially the girls for some reason) were famous for connecting with another teen for a short period of time and sharing all kinds of intimate discussion and then turning around and using it against each other. Sharing it with someone they shouldn’t. Gossiping the information down the grape-vine until someone got hurt. Perhaps you know someone like that right now. They are all friendly and nice to you to your face, but you wonder, “is it real?” Do they really care or is it a fake? Perhaps someone is wondering that about you right now. Are you for real with your relationships? Or are you just faking it? Christians can’t fake our love for one another. Now, that doesn’t mean that we have to always share everything that is on our hearts. We aren’t called to always be open. But we are called to always be honest. I was convicted as I wrote this sermon of the recent times when I’ve told someone in a very “sincere-sounding” tone that I would pray for them and then turned around and promptly forgot to pray. But that’s not what God wants from me. He wants me to be sincere, authentic, without hypocrisy. The English word “sincere” comes from two Latin words, “syn-cere.” In Latin, the prefix “syn” means “without” and “cere” means wax. Without-wax. Because in the middle ages, if you were a potter and you dropped a piece of pottery that you were going to sell, if the pottery had just a “hair-line” fracture, then you might be tempted to cover over the crack with wax. The wax would blend in with the pottery and it would be weeks before the leak would show (or at least until the pottery got close to an open flame)–long enough for you to get away with selling it. So, if you were pottery-shopping in those days, you would ask, is this vase without wax? Is this vase “syn-cere?” Is this vase sincere? God is asking us that question right now. Are there “hair-line” fractures in our “love” for others that we are papering over? Is our love mostly real but 10% fake? Now, there is actually no verb in the original Greek there. It’s possible that it’s supposed to serve as like a heading for the whole section. For our second point, look at the second sentence in v.9. #2. HATE WHAT IS EVIL; CLING TO WHAT IS GOOD. Now this sentence is about hating evil in general and loving good in all of its forms, but it is sandwiched in between two sentences that are clearly about love and transformed relationships. So, I can’t help but think that this verse is about wanting purity, holiness in your relationships. Sometimes we get the idea that if we are going to be a good Christian friend, we will ignore the shortcomings, failures, and sins of our friends. That is not what God says. God says to hate evil even if it shows up in your friend! But isn’t that right? Would it really be love if you just let your Christians friends destroy themselves with sin and wrong-doing? I remember once my wife saying to me, “I hate the evil in you.” And I felt loved. She hates it when I am a hypocrite or when I exaggerate into falsehood or when I am a glutton or when I complain against a holy God. She hates that in me. She wants that gutted out of me. And I hate the evil in her. And that’s love! Do you have a Christian friend who is caught in sin? It very well could be UNLOVING for you to not confront them about it. It could be UNLOVING for you to ignore their failure to obey God’s will for their lives. It would be UNLOVING to simply accept their evil! I hate confrontation. It’s the one thing I hate the most about being a pastor. I don’t mind standing up here and calling sin, sin. But I hate to have to get into someone’s face about it. And I have often failed to do that loving confrontation. Transformed love goes to people caught in since and (gently as possible) shares with them where they are going wrong. That would be unloving. Love hates evil in the other person. Go to that person this week and try to help them expunge the evil. But purity is more than just getting rid of evil. It is also (v.9), “cling[ing] to what is good.” If all you do is go around poking your Christian friends and trying to pry out their bad parts, then you are missing more than half of friendship. The reason why they trust you to poke around in their evil is because you recognize and cling to what is good in them. Do you do this with other Christians? Do you catch them doing something good and right and pure and then congratulating and thanking them for it? “Cling to what is good.” If God is doing something in someone’s life, I want to encourage that, I want to sing God’s praises in their life, I want to bless them for that, I want to cling to it and fan it to flame in them. Don’t you? Isn’t that what the best of Christians do? Don’t they bring out the best in you? This is crucial. My wife is my best friend on Earth. And Heather Joy is committed to seeing what God is doing in my life and then clinging to it. When God has led me to draw closer in prayer, or to confess and renounce some sin, or to take some new step of faith, she is right there encouraging me on in purity. That’s what we need. Transformed people in our lives that hate the evil in us and who cling to what is good in us. Do you see how that is a transformation? We don’t naturally do that. That’s a work of God’s grace. #3. BE DEVOTED TO ONE ANOTHER IN BROTHERLY LOVE. V.10. “Be devoted to one another in brotherly love.” Loyalty. The ESV translates this, “Love one another with brotherly affection.” That gets across the idea. Love must be sincere, love must strive for purity, and love must be loyal with a brotherly kind of affection. The Greek Word is literally, “Philadelphia.” Brotherly love. That takes transformation, doesn’t it? For Christians to see each other as brothers and sisters? We talked about this last week especially with verse 5. This in verse 10 is the family metaphor. We are brothers and sisters in Christ. And I think it boils down to this. We care for each other. Do you care about your brothers and sisters in Christ? Do your have affection for them. Look around this room. Do you care about these folks? Do you care what happens to them, good or bad? As Christians, as transformed people, we are aren’t supposed to be passive or apathetic. We are to love each other with a brotherly love. Now, that doesn’t mean that we are always going to like each other or agree with each other or enjoy being with each other. I have a younger brother and we have not always liked each other or agreed with each other enjoyed being with each other. But we are BROTHERS. We care about each other. Thankfully, after we grew up we came to like each other, agree most of the time and enjoy each other’s company. Yesterday was my brothers’ birthday, and called him to see how he’s doing. Do you call other Christians to see how they’re doing? Do you treat fellow Christians as brother and sisters? A transformed people are devoted to one another in brotherly love. The fourth and last bulleted sentence comes from the last phrase in verse 10. #4. HONOR ONE ANOTHER ABOVE YOURSELVES. That takes humility. That means putting someone else first. Our Christian relationships, if they are going to be good and godly and pleasing to the Lord, need to be contests of deference. Let me ask you a trick question. In your Christian relationships, whether they be husband and wife or friend to friend or whatever, which of you are more important in your relationship? You or the other person? Which of the two of you is more important? It’s a trick question. Before God, you are both equal in worth and value. And you both have equally important things to offer to your relationship. The answer is: neither is more important. So, who is going to go first? Who is going to bend? Who is going to serve whom? Do you see why this quality is crucial? God calls us to outdo one-another with honor. Have you ever had to “take a number” in a line at a store or at the PENN DOT License Center or somewhere like that? And they serve you in the order that you grabbed your number? They call it out or flash it on a screen, “#27, #28, #29"
God calls us to regularly hand over our ticket to our brothers and sisters in Christ. To put them ahead of ourselves in the line of life. Humility. God is calling you to put them first. Do you see how this take transformation? You and I don’t do this stuff on our own. On my own, I do not love sincerely. On my own, I do not hate what is evil and cling to what is good. On my own, I do not love other Christians with a brotherly love. On my own, I do not honor anybody ahead of myself. I need to be transformed by the gospel of Jesus Christ. BUT if I AM transformed, then I need to live a new way. This weekend, I went down to Ligonier Camp and Conference Center to speak at First Free McKeesport Church’s Men’s Retreat. First Free is the church where our much loved Pastor Jack Kelly went to pastor after he was our pastor. And he’s much loved there, too, even though he’s retired. Their current pastor Kirk Albrecht asked me to preach 3 times yesterday on “Me and My Big Mouth,” on the connection between our hearts and our words. And how God wants to change both of them. That we don’t change to earn God’s favor. We don’t change to rack up the points to see if we can measure up and achieve salvation. Salvation is by faith alone in grace alone through Christ alone. And what He did on the cross for us. But that grace changes us. By grace, we are entered into a life-changing relationship with Jesus Christ that starts now and goes on forever. And it changes all of our lives, including our relationships. Not to be saved but because we are saved? There was an older man there, I’d say that he was in 80's. Most of the men at the retreat were younger men, 20's, 30's, 40's, 50's. But this fellow was older and his Pittsburgh neighborhood has changed over the years. And changed for the worse. Where it used to be filled with hard working, respectful steel worker types. It is now filled with people living off of the government and many of them disrespectful and dangerous. This man has witnessed two shootings in his neighborhood in the last few years. And this fellow has been consumed with anger about what has happened to his neighborhood. But this weekend, God got a hold of this man and showed him that instead of sending him to a mission-field, God has sent the mission-field to him. And instead of using his words to curse his neighbors, he is now going to seek ways to use his words to bless them and try to reach some of them for Jesus Christ. This fellows knows Jesus as his Lord and Savior. And that makes that the difference. God loves this man just as he is but too much to let him stay there. He is changing. Even in his mid-80's he is changing. God is building a transformed people. Who live differently than the world. Is your life marked by sincere love? Is your life marked by purity, hating what is evil and clinging to what is good? Is your life marked by brother love? Is your life marked by honoring others above yourself? May it be said that Lanse Free Church is a people being transformed by the gospel.